Benefits & Fundraisers | Upper Peninsula of Michigan Radio - Yooper News, Interviews, Pictures, and Calendar of Events - Great Lakes Radio, Inc.
Marquette, MI – Come Join us to walk for the most vulnerable in our midst, our community members without a warm place of their own. Room at the Inn is a unique expression of Love and Charity to those who need a warm bed, a hot meal, and a safe place to be accepted and helped. Download and share the flyers using the QR Link on the poster below or go to www.RoomAtTheInn.org. 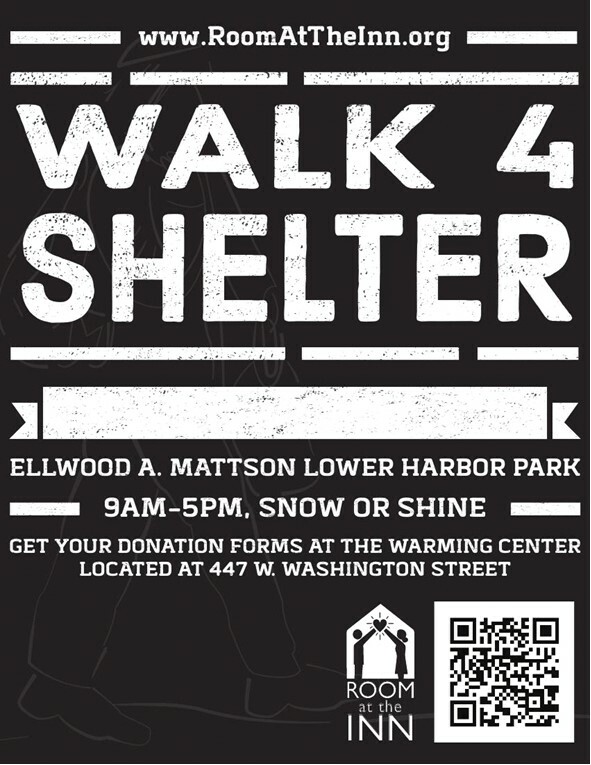 Be at Elwood Matson Park for the Walk 4 Shelter on April 6th, 2019 between 9 am and 5 pm. We take checks and cash only, credit cards on the website. Please fill out the Walker Donor Form and return on the day of the walk. Gwinn, MI – The Up North Lodge will host the 2019 Marquette County Polar Plunge this Sunday, March 17th at 10:30 am. Registration is now open! The Up North Lodge will host the 10th annual Marquette County Polar Plunge for Special Olympics Michigan! The plunge takes place at The Up North Lodge (215 S. County Road 557) in Gwinn. Registration begins at 9:00 AM with the parade of costumes starting promptly at 10:15 AM. The plunge begins at 10:30 AM where participants will brave the cold and plunge into a pool in the parking lot of The Up North Lodge. Awards and an After-Splash Bash party will begin immediately following the last plunger. The Polar Plunge series is known for its zany costumes and courageous participants. After raising funds, these participants dress up in costume and prepare to plunge, ready to jump in and freeze their fur for a good cause. Money raised goes to providing free sports training, competition and health screenings for more than 23,000 children and adults with intellectual disabilities in Michigan. The annual Michigan Law Enforcement Torch Run (LETR) Polar Plunge is the largest fundraiser for Special Olympics Michigan (SOMI), raising more than $1 million dollars each year. 30 Polar Plunges are scheduled to take place across Michigan this winter. A complete list of plunges can be found at PlungeMI.com. Marquette, MI – The Pigs-n-Heat hockey game is on Wednesday, March 13th at 7 pm at Marquette’s Lakeview Arena. Our awards ceremony will begin at approximately 6:30 pm. Pigs-n-Heat pits local Firefighters and Law Enforcement Officers in a fun and spirited hockey game along with a family atmosphere, mascots, many prizes, awards, games, and giveaways. Tickets are only $1 and enter you to win prizes up to $1000.00 in cash. They can be purchased from local Firefighters and Police Officers. Alpha, MI – “Brews for Brookies” kicks off Saturday, March 9, 2019 all day long at the Alpha Michigan Brewing Company on the Circle in Alpha, Michigan. Drop in any time and enjoy the beer, food and fun. For information call 906-265-2371. Newberry, MI – The 37th Annual Woodchopper’s Ball will be held Saturday, March 9th starting at 5:00 pm at the American Legion Hall in Newberry, MI. The fundraiser benefits the Tahquamenon Logging Museum. A roast beef dinner will be followed by live music and dancing. For more information and for ticket prices, visit the Tahquamenon Logging Museum website. Negaunee, MI – The Negaunee Elks Lodge #116 is partnering with the Westend Gearbusters Robotic H.S.- FIRST Robotics Team 4375 for their Saturday, March 9th Pasty sale, taking place from 1-4 pm. The Negaunee Elks Lodge puts on a monthly Pasty sale from September-May each year to help raise funds for local organizations. Proceeds from the March sale will benefit the Westend Gearbusters H.S. Robotics team and help with the team expenses during their upcoming competition season. Pasties cost $5.50 each and are available freshly baked or frozen. You can order pasties by contacting any Robotics team member, Coach Doug Elliott at 249-3792 or by calling the Negaunee Elks at 475-4401.